More and Ashfurlong Quarter, or More et Asshforlong as it appears in the 1416 Court Roll, is shaped like a lamb chop. Whereas the other four Quarters include ancient settlements with open fields dating back to Saxon times, the houses and fields of More and Ashfurlong mostly date from the thirteenth century or later, as the increasing population and strong markets made it worthwhile to bring new land into cultivation. It may be that there were originally only four quarters, and it was only in the thirteenth century that the extra “quarter” was created, taking in parts of the former Great Sutton, Maney and Little Sutton Quarters. The purple line on the map is my estimate of the boundary of the quarter, taking in School Farm and the Glebe land of the Rectory, both of which had once been part of the open field system of Great Sutton. As with the other quarters, More and Ashfurlong was represented at the 1416 court by two elected tithingmen, known as “Headboroughs”. They were John Jolyf and John Smith, who reported that two new householders had come to live in the Quarter and had been sworn in, so the population of the quarter was still increasing even at this period of slack growth; they had disbursed tenpence in poor relief, which was twopence more than the Maney headboroughs had given in their Quarter. In the north-west corner of the quarter lies Moor Hall (just above the g of Coneygree) where Bishop Vesey was born. When Vesey returned to Sutton in the 1520s most of the land to the east of Whitehouse Common Road and Hollyfield Road was waste ground. The town charter secured by Bishop Vesey in 1528 included a clause encouraging entrepreneurs to come to Sutton by offering them favourable terms if they would build a house on the commons and take in up to sixty acres. 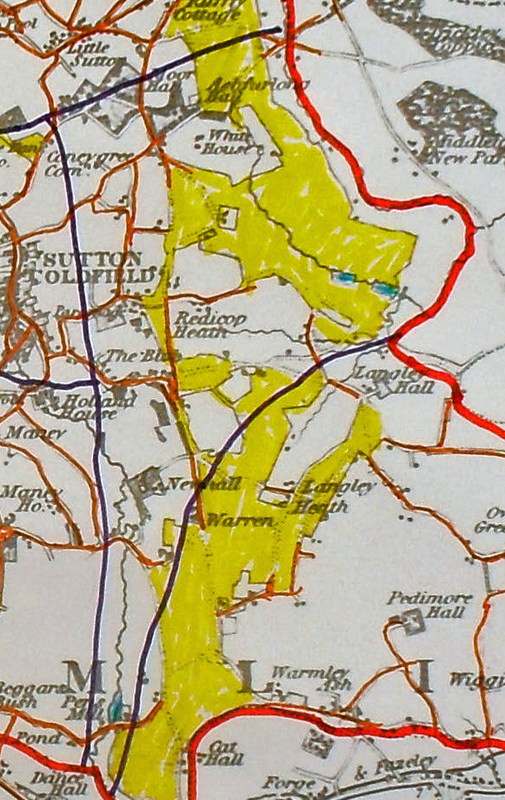 Some of the white areas on the map which are surrounded by commons, notably at Ashfurlong, Wheatmore, Langley Mill Farm and Falcon Lodge were taken in from the commons thanks to this clause. The smaller white areas were mostly the work of squatters. When Bishop Vesey established the grammar school he endowed it with land to the west of Whitehouse Common Road which became known as School Farm. In the twelfth century land between Rectory Road and Reddicap Hill became the Rector’s glebe land (the rambling medieval timber-framed Rectory of twenty-two bays was replaced by a brick house in 1701). Land south of Reddicap Hill was the Manorial managed woodland in 1086, later cleared to make way for New Hall and New Shipton. 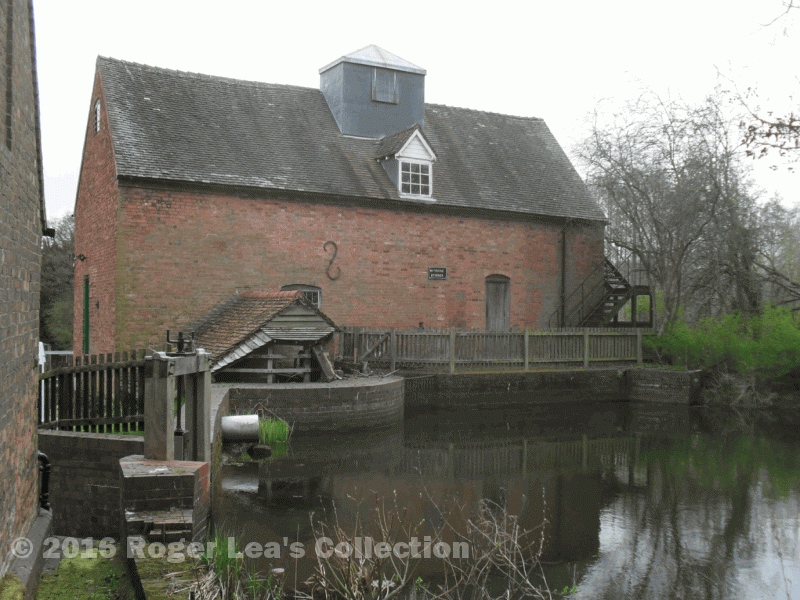 Penns Mill was built on part of New Shipton Farm near the Erdington boundary probably in the 1580s, just after Thomas Gibbons, the owner of New Hall, had established New Hall Mill on his land. More and Ashfurlong Quarter outlined in purple on Greenwood’s 1822 map of Warwickshire. New Hall Mill was in More and Ashfurlong Quarter. You can still see parts of the original Elizabethan building when you visit on the next Open Day, Sunday May 11th.